I have recently got a load of CZ 452 Military Trainer and UltraLux rifles. I really like CZ rimfires. They are called "Czech Anschutz" for the quality workmanship and superior accuracy, and unlike real Anschutz, the do not break the bank. They are also unique these days because they feature real military open sights - the only currently produced rimfire rifle that has them to my knowledge. Perhaps for this reason they are difficult to get, so when they show up at my distributor, I usually get all I can, and they typically last for a few weeks. My own CZ 452 experience started with an UltraLux back when I had very little knowledge about rimfire rifles. They were not as rare back then, so one could actually chose what he or she wants, rather than what is available. I thought that a longer 28.6" barrel would automatically result in better accuracy, so I chose an UltraLux. Shortly thereafter I found a decent deal on a Military Trainer, and bought it as well. Surprisingly, I found MT to be casually more accurate - I did not test either rifle specifically, but MT seemed to shoot smaller groups with whatever ammunition I used at the time (mostly CCI and Wolf). So gradually UltraLux gotten delegated to the back of the safe, and from there to the factory box and into the long term storage. After starting Precise Shooter and making CZ 452 a part of my regular stock, I noticed a few things. First, UltraLux rifles are much more rare than other CZ 452 variants. I can get Military Trainers about 3 times a year, but UltraLuxes only maybe once. The only CZ rimfire rifle that is harder to get than 452 UL is the 453. Second, they are much more popular. When I have both, people buy two UltraLux rifle for every one Military Trainer. Third, the factory targets on UltraLuxes universally show a lot wider dispersion than the ones included with the Military Trainers. Now, factory targets are not really reliable accuracy indicators. As I discuss here, one group does not make a statistic, and even a very poor rifle will once in a while shoot a one hole group. 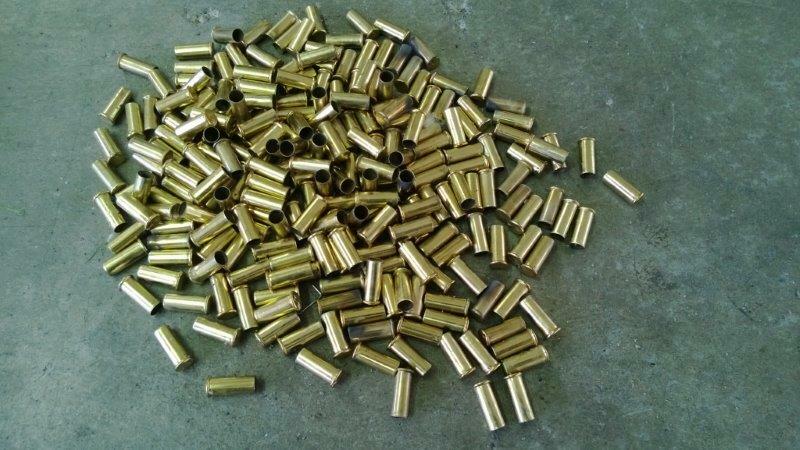 Plus, rimfire rifles are extremely sensitive to accuracy of ammunition, so even if they shoot crappy groups with whatever they use at the factory, it does not mean that there is not a type of ammunition that will shoot really well in them. It looked like a lot of people expected the rifle to be more accurate than MT, and it also looked like the reality might not be in line with the expectations. So I set out to find out for sure. 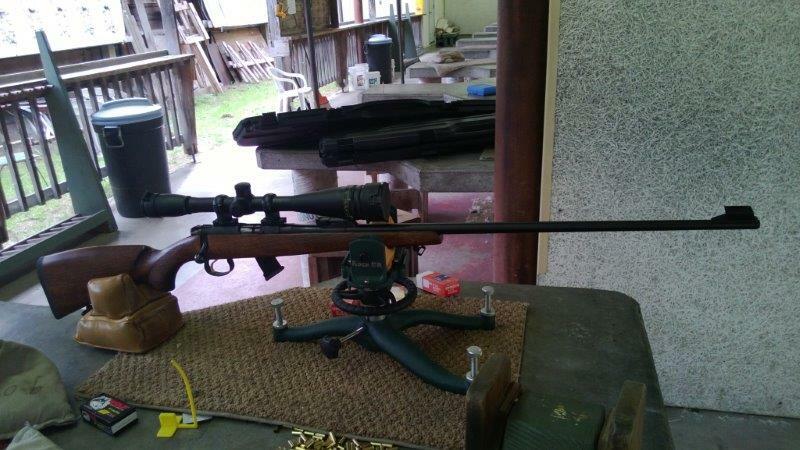 I got the rifle out of storage, equipped it with 36x Sightron scope, and took it to the range with a whole bunch of quality 22lr ammunition. As always, I have tested the rifle at 100 yards, firing 5-shot groups of multiple types of match ammunition. This resulted in the following targets. As always, I removed the first group if it was significantly different from the subsequent groups, to let the lube from the previous ammunition fully clean out. 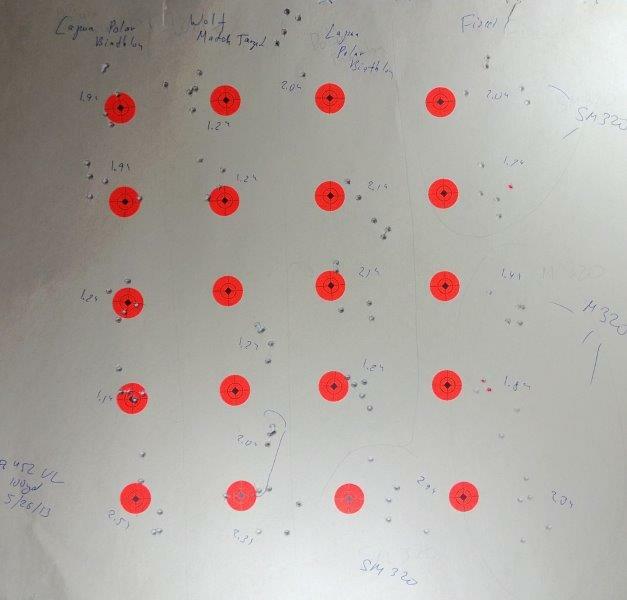 In the case of Wolf, I had to remove the first two groups, as the second group had the very first bullet fly way low, and the rest grouping into a single hole..
As you can see, compared to CZ 452 Military Trainer, the rifle shot poorly. There was no groups that averaged to below 1", and Wolf and SK did the best with 1.2 and 1.3. The rest was... awful. 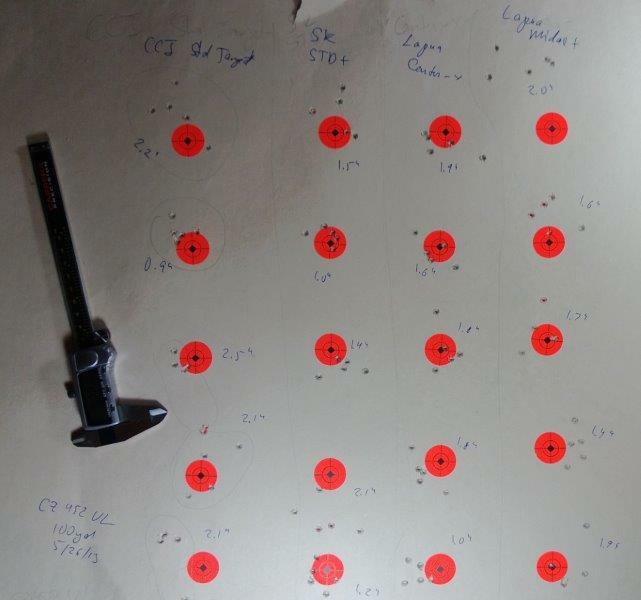 On the other hand, a lot of ammunition brands performed quite well in the Military Trainer test. Whether it was me or the rifle, I do not know. Most of the modern 22LR ammunition IS in fact designed to shoot in shorter barrels, as most rimfire rifles produced today are relatively short. Also, most of my experience shooting rimfire was with the shorter barrels. Perhaps I was not doing something crucial that should have helped with the whiplash effect of the longer one. Be it as it may, if you are new to CZ 452 line, I have to recommend buying a Military Trainer first. It will shoot better with wider variety of ammunition. If you are a very good shooter and are willing to experiment with many brands, the UltraLux might present an interesting challenge, and if you are shooting from open sights, the longer sight radius of a longer barrel may benefit you more.